Ever heard of Dan Marlowe before? No? Well, that's not too surprising - very few people have, which is a real shame. However, it is possible you happened across the name inadvertently in Stephen King's 'The Colorado Kid.' Published by Hard Case Crime, the novella's a very minor and mostly forgettable effort from King, but it does have a couple of things going for it. One is the great cover by Glen Orbik - which incidentally has nothing to do with the actual story itself - while the other is the nice dedication from King at the beginning, which reads: "With admiration, for DAN J. MARLOWE, author of 'The Name Of The Game Is Death': Hardest of the hardboiled." And he's right. 'The Name of the Game is Death' is one of the hardest-boiled crime thrillers I've ever come across, and believe me I've read quite a few. In it, an unnamed heist man - who sometimes goes under the alias of Chet Arnold, and sometimes Earl Drake - goes on a rampage as he attempts to track down the killers of his partner and recover the money owed him. To label the character as single-minded and ruthless would be a major understatement. He's more like a force of nature, cutting a violent swath through the landscape as he chases after the foolish people who've screwed him over. Reading it you just know it's all going to end in tears, which it ultimately does for pretty much everyone involved. That book came out in 1962 (the same year Richard Stark's very similar Parker character was first introduced) and not only received a lot of respect from within the industry but sold in fairly good numbers too. Afterwards, Marlowe wrote a number of mostly excellent standalone crime thrillers (e.g. 'Strongarm,' 'Never Live Twice,' 'Four For The Money,' 'The Vengeance Man'), but none of them proved to be the breakthrough success he craved. Then in 1969 one of his buddies urged him to bring back the 'Name Of The Game Is Death' character for a sequel, and suggested this time Marlowe give him the permanent name of Earl Drake. Marlowe accepted the challenge and quickly came up with a worthy follow-up called 'One Endless Hour,' in which Drake spends much of the novel recovering from the appalling burns he suffered at the end of the previous book. As a result, he not only becomes expert in the use of make-up (initially to cover up his numerous scars), but also assembles a collection of toupes with which he can disguise himself depending on the situation. 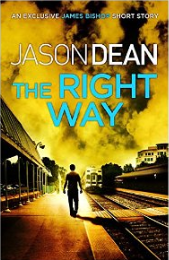 The rest of the novel follows Drake as he attempts to set up a daring new bank heist to finance his new life. I don't have any figures in front of me, but I'm guessing the book must have sold fairly well because it was at this point that Marlowe's publisher asked him to develop a whole series of books starring Drake. But the offer came with two very important conditions: 1) Drake would have to be toned down considerably from the near psychopath of the first two books, and 2) they wanted him turned into a secret agent type, since those were the kinds of books that were selling at the time. Perhaps against his better wishes Marlowe complied, quickly softening Drake's rougher edges and turning him into a very reluctant freelance undercover agent for the CIA. He even brought back Hazel, the big tough redhead Drake bedded in the first book, and turned her into his regular girlfriend. It's a very hit and miss series, it has to be said. The next two books ('Op. Fireball' and 'Op. Flashpoint') are both solid examples of their type - especially 'Flashpoint' which won the Edgar Award for Best Paperback Original - and feature a Drake who hasn't completely lost his rawness of old. But the four that came after those ('Op. Breakthrough,' 'Op. Drumfire,' 'Op. Checkmate,' & 'Op. Stranglehold') are mostly pretty forgettable potboilers, partly because the espionage plots simply aren't that interesting and partly because Drake's CIA superior, Erikson, starts taking center stage for some reason, and he's even less interesting. So in effect Drake almost becomes a supporting character in his own series, which is pretty weird to say the least. Especially when you consider the books are all written in first-person. Anyway, starting with book no. 9 ('Op. Whiplash'), Marlowe finally gained some control over the direction of the series and ditched the espionage elements entirely - along with the seriously dull Erikson - and allowed Drake to simple exist as himself again. And this is where the series became fun again. That ninth volume is a satisfyingly rough and ready sequel to the original 'Name Of The Game', while the tenth and twelfth volumes ('Op. Hammerlock' & 'Op. Counterpunch'), with their interconnected Mexican-based revenge plots, work almost as a two-parter - and a pretty good one at that. 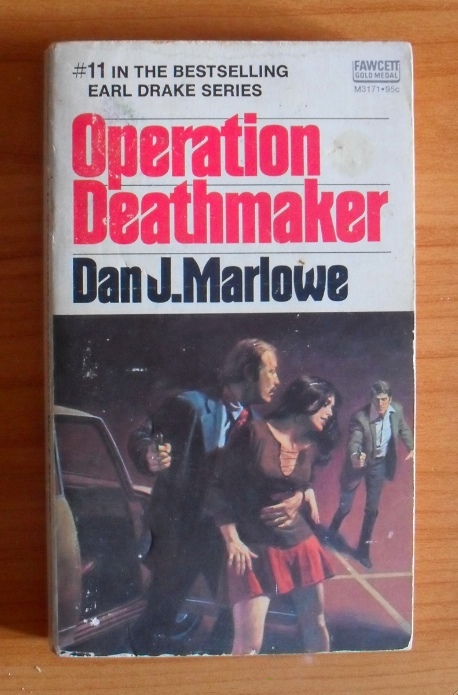 But it's the eleventh Drake thriller, the standalone 'Operation Deathmaker,' that really stands out for me. Admittedly it's not as riveting as the first two Drake novels, but in my opinion it easily outshines all the other books in the series. The whole story takes place over a 36-hour period, and like the rest of the series it's all told in first-person. 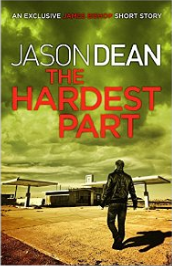 We start with Drake as he drives Hazel's teenage niece, Melissa, to LA International Airport. She's been visiting for a few days and now has to head back east in time for the new college semester. But before they can even get to the terminal, two armed men assault them in the parking lot and one of them knocks Drake out with a gas bomb. 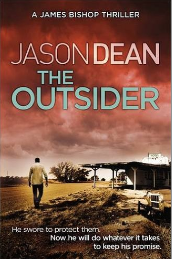 Waking up to find Melissa gone, Drake speeds back to the motel and updates Hazel on the situation and then gets a call from the kidnappers who order him to drive to a specific pay phone for further instructions. At the same time, Hazel spots a junkie breaking into their car parked across the street and heads outside to confront him. She's only yards away when the junkie turns the ignition and the car explodes, seriously injuring Hazel in the process. Drake, aware that the bomb was meant for him and that his criminal background immediately puts him at the top of any suspect list, enlists the help of Valerie Cooper, another motel guest with whom they've become friendly, to take care of Hazel and the cops while he speeds off to the designated pay phone to await the kidnappers' next call. And that's just the first chapter. The rest of the book's perhaps not quite as frenetic as that opening, but Marlowe still manages to keep things bopping along at a rapid pace as we follow Drake's increasingly desperate efforts to get Melissa back in one piece. 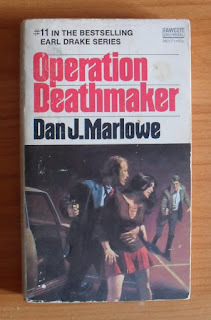 Like the others in the series, 'Operation Deathmaker' is only a brief read at 176 pages, and because of the first-person storytelling there are no real sub-plots to speak of. This means everything's stripped down to simple cause-and-effect, which works really well for stories like this one - where urgency is key. But I think there are also a number of other reasons why 'Deathmaker' works so much better than the three mentioned above. For a start, it's great to see Drake working solo for the first time since 'The Name Of The Game...' and 'One Endless Hour.' Hazel's a strong character, but that's not always a good thing in a series such as this. After all, it is Drake's name on the cover, not Hazel's. In previous books her presence generally compromised his usual hard-boiled approach to solving problems, plus she often helped him get out of a number of rough scrapes which didn't exactly strengthen his character either. 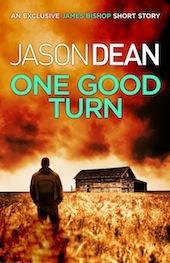 But with her now laid up in hospital, Drake is back to relying on his own wits and ingenuity to stay one step ahead of the cops and get Melissa back, and the result is a much more satisfying narrative than usual. And that's another plus. 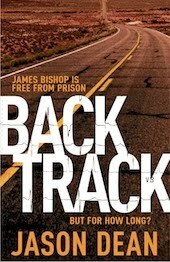 Throughout much of the book, Drake has to once more immerse himself in his old criminal life to get what he wants. He simply doesn't have any other options. When the kidnappers give him a 24-hour deadline to get the $400,000 they want for Melissa, Drake knows the only way he can possibly accomplish it is by utilizing his old safe-cracking skills. Marlowe then treats the reader to a detailed account of Drake's planning and preparation of the job. First, he chooses his mark - a heavily protected brokerage firm with a lot of cash in the office safe - and gets a layout of the place, then he gets in touch with an old contact who can supply him with the necessary tools he'll need. Then comes the actual job, which Drake performs with his usual acumen and skill. It's all gripping stuff, with Marlowe portraying Drake as the self-sufficient professional criminal he used to be before Hazel entered his life. And the villains are great, too. You really couldn't wish for a nastier bunch of sadists. And when Drake inevitably decides to turn investigator and dig out their identities himself, the reader's with him every step of the way, hoping they'll finally get some of the same treatment they've been handing out to others. (Hint: they do.) And the inclusion of the Valerie Cooper character also adds some nice sexual frisson to the plot, too - something that's been missing from the series since Hazel became a regular supporting character. The book's not without its drawbacks, however. For one thing there's the Melissa character - who's kind of a cipher at best. We're barely introduced to her before she gets grabbed by the bad guys so we don't ever really get to know her, and we definitely don't know what she means to Drake or Hazel. In fact, if anything, Marlowe paints Drake as being fairly indifferent to her presence, which makes it all the more puzzling when he goes all out to get her back at any cost. Also, there are a few red flags along the way that should have raised Drake's suspicions regarding not only the kidnappers but Melissa's welfare, but he conveniently ignores them in order to keep the plot moving forward, which is a little lazy on Marlowe's part. I sat down in a chair with my cleaned-and-oiled automatic in my lap and waited for the money to dry. When it did, I'd check out. Nothing should tie me to the Miramar, but it made sense to use another motel until I could spring Hazel. I sat there, smoking an occasional cigarette, until it was time to pack and leave. Now that's the way to end a story. No muss, no fuss. Unfortunately, there was only one more Drake novel to come before the series came to an untimely end. This was probably due to sales, although Marlowe's serious health problems at the time may have also had something to do with it. But at least the series went out with a bang rather than a whimper. Now for a long time the only way to read the series was to pick up old paperback copies from online secondhand stores, and some of those latter books could get quite pricey - probably due to lower print runs. But with the rising popularity of eBooks a large part of Marlowe's bibliography (including 'Operation Deathmaker' and most of the Drake series) has now become available again from Amazon - and often at vastly reduced prices. So now you've really got no excuse. ** For further reading, I cannot recommend highly enough Charles Kelly's superb biography: 'Gunshots in Another Room - The Forgotten Life of Dan J. Marlowe.' In what is clearly a labour of love, Kelly recounts an amazing life that was as bizarre as it was tragic, encompassing amnesia, bank robberies, gambling, and plenty more besides. In fact, it's the kind of story that could have come from within the pages of one of Marlowe's own books - proving the old adage that life can sometimes be stranger than fiction. So anyway, it was while I was rereading the focus of this week's post that I realized I'd only actually read BINARY once before. Which amazed me, frankly, because for some reason it's one that's really stayed with me over the years. Possibly because it's such an overlooked part of Michael Crichton's bibliography, or maybe it's because this was the first Crichton book I ever read which in turn motivated me to seek out all his other books. I'm not really sure. But I do know that it seemed to be much better than I remembered the second time round, which was an extra little bonus I hadn't counted on. I only wish it happened more often. There. Told you I'd be brief. So what we have here is a fairly straightforward race-against-time thriller set over a twelve-hour time period. Crichton makes it quite clear right from the start. There are 13 chapters in the book. The first comes under the title of 'Hour 12.' The last is 'Hour 0.' So once we get past the prologue - a dry account of the train robbery in the form of an official government report - we're off to the races as Graves tries to outguess his latest adversary before he can wipe out a whole city. They came to the street and ran outside. By his side Nordmann was puffing, red in the face. Graves felt no strain at all; he was tense and full of energy. The cop went off to get some. He found himself worrying about Wright's new apartment in San Diego. Perhaps this was all a diversion, a feint to get him away from the apartment while something important was done there. He had no confidence in the men sitting across the street, observing and filming. Like every organization in the world, the State Department hired mundane men to carry out mundane jobs. Stationary surveillance was the most mundane. If the men weren't dull when they started, they soon became that way. Crichton writes in third-person, but he manages to keep a pretty tight rein on the narrative by focusing on Graves' POV consistently throughout the book. Or almost. As I mentioned, I'd only read the novel once before so I was under the impression he never veered away from the main character at all (much as Roderick Thorp never strays from Joe Leland's viewpoint in NOTHING LASTS FOREVER - see earlier post), but he actually deviates on three occasions. The first is when when he devotes the entire 'Hour 8' chapter (unnecessarily, in my opinion) to one of Wright's goons as he helps hijack a couple of trucks whose contents are essential to Wright's plans. And in the final chapter, Crichton moves the camera a couple of times to focus on a pair of cops standing guard outside a certain room. Granted, this one's a little more necessary, but I think Crichton could easily have found a way around the problem in order for the narrative to stay with Graves, because it's kind of a distraction when he pulls away. Admittedly a very minor one, but noticeable nevertheless. And it has to be said, BINARY is a perfect title for the book. Not only is it a crucial element of the plot - Wright's file lists him as a mathematical genius obsessed with the idea of 'two component reactions leading to a single event or outcome' - but it reflects the central theme running through the book, which is that of duality. I mean, it's really hard to miss. Crichton points out on numerous occasions how the protagonist and antagonist are mirror images of each other (at one point he even writes, 'He and Wright were well matched,' just in case you didn't grasp it the first time round). Both men are also named John, both are gifted chess players, both have similar mathematical backgrounds, both have to win at all costs, and so on and so on. In fact, although the narrative takes the form of a running investigation the whole book's set out like a chess match, with Graves and Wright constantly trying to trip up the other without leaving himself open to psychological attack. As a result, one could say that there's very little actual physical action in the story, but you'll find you're too busy turning the pages to notice. Whatever his faults (generally lackluster characterization, for example), Crichton was a real master of the thriller genre and in this one he really manages to keep the pace up all the way to the end. 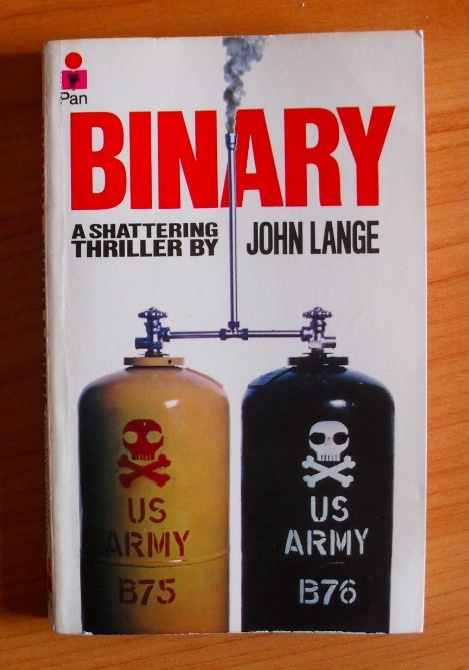 I'm writing this and I've only just realized I haven't yet touched on Crichton's use of the pseudonym, John Lange (lange is German for 'long' - Crichton was six-foot-eight), and it's worth a mention. Crichton wrote eight thrillers under the Lange pen name at the beginning of his career, of which this was the last. Printed in 1972, it acts as kind of a bridge between the more straightforward thrillers of old and the techno-thrillers he'd soon become famous for. (By this point, he'd already published 'The Andromeda Strain' under his own name to great acclaim, and the one after this would be the excellent but less popular 'The Terminal Man'). As a result, this one not only features more of a techno-flavoured storyline than previous Lange books, but Crichton also employs the method he used in 'The Andromeda Strain' of including official documentary 'evidence' to suggest the events he's writing about are based on something that actually happened (the very first words are, 'The facts were these:'). And why shouldn't he? After all, it's a great gimmick I'm sure many other writers of the time wished they'd thought of first. * Throughout the story, Graves has a fairly antagonistic relationship with his immediate boss, who goes under the name of Phelps. Graves and Phelps. Fans of the classic Mission: Impossible TV series will need no further explanation of the relevance of these two names. A nice little tip of the hat there from the author, I thought, especially as the last act closely resembles a typical episode from the series. ** They also made a TV movie of the book called 'Pursuit.' Made in 1972, the 72-minute film stars Ben Gazzara as Graves and E.G. Marshall as Wright. I've only seen it once a long time ago and it isn't bad at all, although it's 'made-for-TV' elements are obvious and it lacks much of the excitement of the novel. However, it's notable for being the first film directed by the multi-talented Crichton himself, perhaps as a test run for the far more successful 'Westworld', which he wrote and directed the following year. For those wishing to seek it out, I believe it's currently available on DVD. So for the third in this series of blog posts, we're sticking with the seventies again (as we will do for many of the posts to come) for another tight little thriller that manages to come in at just under 200 pages. 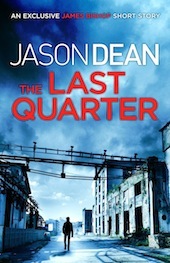 Except, as you might guess from the cover, this one's not your usual crime thriller. 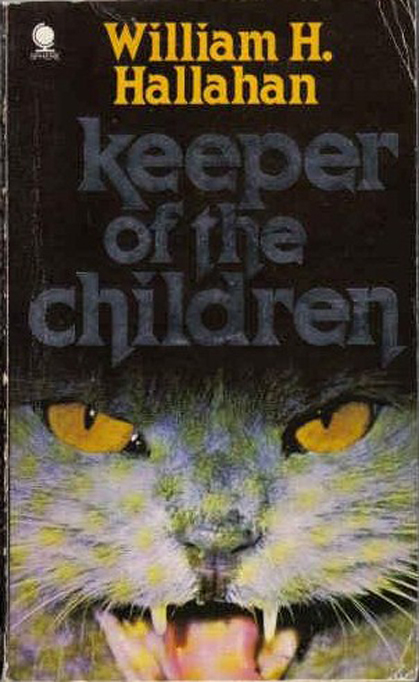 If we're going to go the label route I'd have to say 'Keeper of the Children' is more your 'Horror/Suspense' hybrid, which is partly the reason I like it so much. It starts out simply enough. Eddie Benson, a successful TV ad producer, returns home to Philadelphia after a long shoot to find his wife and son at the airport, but no daughter. He soon learns that fourteen-year-old Renni has run away with her best friend to join a cult of beggars under the control of a Tibetan Buddhist monk named Kheim. Quite why Eddie's wife waits until he gets back to give him this information is never adequately explained, but anyway, Eddie soon sees Renni out on the streets with her two dozen similarly-aged cohorts, all of whom wear orange robes and beg for money all day before heading off to the 'temple' where they all bed down, ready to do the exact same thing the next day. As it turns out, the police are powerless to act since Kheim isn't actually doing anything illegal. The kids under his roof aren't being abused, they're fed well, clothed in clean robes, and the 'temple' itself is kept spotlessly clean on a daily basis. And when Eddie talks to a group of angry parents in the same position, he discovers that simply 'kidnapping' your kid doesn't work either, as he or she is apparently brainwashed into running back to the temple at the earliest opportunity. He also learns the leaders of this group are planning to deliver documents to Washington proving that Kheim is in the country illegally so they can have him deported. Unfortunately for Eddie, before the evidence can actually be delivered, the group's ringleaders soon begin dying in very odd ways. And when I say odd, I do mean odd. For instance, one gets beaten to death by a scarecrow, another gets torn apart by a group of street cats (see cover), while a third has a fatal run-in with a clothing dummy and a golf club. Naturally, it soon becomes all fairly clear to Eddie - and the reader - that Kheim's able to astral-project something fierce (this is the seventies, after all) with the ability to place his consciousness inside a variety of inanimate objects and small animals at will. And Eddie, as the last man standing, is his next intended victim. Now honestly, how could I not buy this book? Especially as I'm fairly sure I once had a nightmare exactly like that, where some unnamed axe-wielding creature was climbing up the stairs to chop me up into small pieces. Or maybe I dreamt it after reading the book, I don't know. 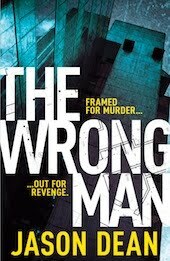 All I can say is the book delivered on its promise of offbeat thrills and spills, and that was perfectly fine with me. Especially at that age. I should add that I've reread it a number of times since and while I notice the novel's faults more now, I still enjoy it as much now as I did back then. Because there is a lot to like about this book. It helps that Hallaran's a fine writer who's able to give his characters interesting and natural-sounding dialogue. He doesn't allow his prose to get in the way of the story either, and his matter-of-fact recounting of the more fanciful aspects of the plot help make the absurd seem all too plausible. He also does a nice job of foreshadowing right from the start. For instance, we get a sense of otherwordly dread within the very first pages when we sample Renni's slightly ominous marionette dolls (one of whom will play a central role later), and we also briefly meet one of the many stray cats we'll see throughout the book. It also helps that the hero of the piece, Eddie Benson, is an appealing lead. Although it's only a short book, Hallahan does a pretty decent job of filling in the man's character so the reader can fully identify with his predicament - which is essential when you're dealing with a plot as bizarre as this one is. I only wish Hallahan had given the villain of the piece the same level of attention, because as it stands Kheim is a one-note character straight out of central casting. Not only that, but we never get his POV at any point, so we don't actually know what motivates him to do what he does. He's simply EVIL and that's that. Nevertheless, his malevolent presence does permeate the whole novel from beginning to end, so who knows? Maybe Hallahan knew what he was doing by leaving him a blank slate. Hallahan also paces the book well, so that we're approximately at the halfway mark when Eddie decides it's time to get proactive and take the battle to Kheim. This is the most enjoyable part of the book for me, as with the help of an elderly Indian yogi, Nullatumbi (another one straight out of central casting - the wise and good mystic), Eddie spends fifty pages learning how to master his mind in preparation for the battle to come. On the one hand, the whole idea's totally ridiculous. Of course it is. Even if astral projection were possible it would take - as Nullatumbi actually makes clear at one point - a dozen lifetimes of study to master, yet Eddie manages to get the hang of it in about two weeks - which is pretty good going for a newbie. And a Westerner, no less. Yet you find yourself simply going along with the whole concept since it's being told with such verve and enthusiasm. Another point in the book's favour is Hallahan knows how to write action. And not the straightforward stuff either. Without giving away too much of the plot, there's a fantastic scene midway into the book where a stuffed bear does battle with a small stuffed mouse and basically lays waste to a house in the process. 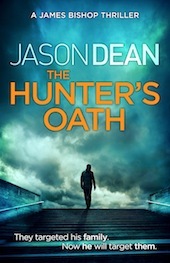 They even used the scene for the cover of the US paperback edition (check out my Facebook page for a sample - you can access it from the home page of my website). Later on, there's an even better sequence where a female street cat has a no-holds-barred scrap with an alpha male tomcat - all told from the cats' points of view. It's really great stuff. At the time these were scenes that felt totally new to me and to be quite honest, they still feel that way today. One thing's for sure - Hallahan could never be accused of going the predictable route. So what's the downside? Well, the book could possibly have been improved by being longer, perhaps allowing the supporting cast to be fleshed out a little more. Although I have to admit the rapid pace of the story would have clearly suffered as a result. Swings and roundabouts. And I've read the book a number of times and I still can't figure out what Kheim's getting out of this. Okay, so two dozen begging kids probably rake in a fair amount of change on a daily basis, but that's all it is. Small change. Kheim's clearly a bright individual, so couldn't he have aimed a little higher than living off the proceeds of panhandling? And while I'm at it, some of the parents don't seem to be nearly as worried about their offspring's welfare as I'd imagine a parent would be today, which is a little puzzling. Or maybe that's simply the seventies for you. But these are all minor quibbles, really. No book's perfect (except maybe 'The Maltese Falcon'), and we can all pick holes. But let's face it, this is not a book you should be taking too seriously anyway. It's just a fun occult thriller that'll keep you glued to the pages, and really, what more can you ask than that?